The recent needs of multi use communications and informations have brought us unexpected various nor and interferences to the environment in our daily life. Especially the RF noise gives to radio communications a great deal of disturbance. Now the most of major cities in the world have an advantages of paging service. However this kind of services on the other hand, with a big transmitting power affects interference to the ordinary radio communicatic In this circumstance, HX290 is newly designed against to the field noise so as to receive only a pure sig for the best communications. In addition, the HX290 is designed with a superb cost-performance in attractive industrial design with the up-to-date advanced technology. HX290 is provided originally with features in its factory standard, so no additional accessories are needed except a trunking logic board smartrunk system. HX290 with its water-tight design is resulted under the extreme test by continuous 48 ho salt water spray, so the HX290 is designed to guarantee its mechanical performance as a weatherproof radio to use for a real industrial field purpose. New technology made it possible design the HX290 smaller in size as 130 mm high, 56 mm wide and 32 mm depth, and lighter in weight of 370 g even with standard ni-cad battery pack of 1100 mAH for 5 watt RF power. HX290 designed to fit your palm even with high capacity battery pack of 1500 mAH. Mechanical construction of HX29 complies with MIL STD for protection against shock, vibration with it's materials of polycarbonate and polyester alloy, and with chassis of aluminum alloy. The channel selector allows for switching to one of desired channels out of programmed multichannels quickly. By pushing lamp key for more than 2 seconds, all the key functions stop except power switch, volume PTT, Monitor, and lamp. This loci prevents the operation from mis-touch on keys by accident. Standard battery pack is enough operation by CNB290 with 1100 mAH for your usual operation of hours. If 10 hours operation is needed you can chose CNB291 with 1500 mAH. Belt clip with standard accessories from factory standard is provided with 45 mm width belt. Wide band (25KHz) or narrow band (12.5KHz) channel spacing is possible in each channel by computer programming. Memory scan or priority scan or all scanning is possible by programming. Repeater operation is different TX and RX frequency. This function makes it possible to change TX frequency to RX frequency automatically for the same frequency in the same channel. Then direct communication is available without using repeater station. At the Busy mode when receiving, transmission is inhibited. On/off is programmable. With the DTMF built-in model, using DTMF signals (from 0 to 9, A.B.C.D. and blank), up to 21 digits ANI code can be transmitted when PTT switch is either pressed, released or both pressed and released. Program of unique ANI code can be made among a huge number of combination per in quite an easy procedure. 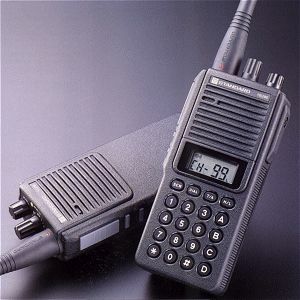 HX290 has a provision of paging operation using DTMF signals and enables to call a specific station (individual call) or members of group (group call) while transmitting the own code or a specific status code in 3 digits. Even when in this mode, HX 290 switches easily to the normal radio mode and voice communication is available. It is possible to call answer back within 1 second after receiving a call by paging function of DTMF on HX290. Cloning of frequencies or other functions is possible to other radio by using RF wave. No need to program individually one by one for many radios. MOS Field Effect Transistor makes it better performance for receiver. Transmission is possible to continue for max.5 minutes. Then to force to cut to change to receiver mode. On/ off is possible by programming in each channel. Even after PTT switch is released, TX is still possible for the time duration of OFF/300ms/500ms/800ms. Beep sound comes out at a low battery voltage with indication "Lo" on LCD readout. It is possible to save battery life by Programming the battery saver parameters in millisecond step. Hi/Lo transmission power is programmable in each channel. Simple construction with only one piece of multi-layer P.C. board makes it easier for maintenance & servicing. Smartrunk II ® is functionated whe optional Smartrunk board is installed in HX290. It is possible to disable all function of the HX290 in case it is stolen. Sending a special code makes only the stolen radio locked to keep confidentially of your communications. SIMPLE 16 CHANNELS, MULTIPLE 100 CHANNELS. 5 WATTS (VHF)/4 WATTS (UHF) RF POWER. BUILT-IN CTCSS (50 TONES), DTMF, AND VOICE SCRAMBLER. 12.5 KHz/25 KHz CHANNEL SPASE PROGRAMMABLE. A.N.I. (automatic numbering identification) BY DTMF.